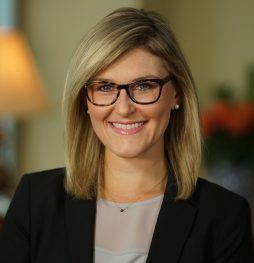 Alexandra (AJ) Jensen is a Managing Director of Grants and Federal Affairs at McAllister & Quinn, where she provides strategic planning and grant support for the firm’s higher education clients. AJ leverages her experience with grant writing and grant management to assist the firm’s higher education clients with identifying and pursuing external funding opportunities. AJ is constantly in contact with federal agencies and foundations both on behalf of clients and in order to proactively monitor the status of various grant competitions. In addition to her current work with colleges and universities, AJ has experience working with international and domestic nonprofit organizations and fostering dynamic public/private partnerships. Prior to joining McAllister & Quinn, AJ served as a Project Manager at Cooper’s Ferry Partnership (CFP), an economic development company in Camden, New Jersey. During her tenure with CFP, AJ developed, co-wrote, and managed multiple large grants for her organization. AJ has a bachelor of arts in global studies and development from St. Lawrence University in upstate New York.